Vasudeva (Vishnu), Mathura, c. 400 A.D.
Part Twelve of a monograph by Ramaprasad Chanda, published by the Archaeological Survey of India, 1998. (2) a word of three or four aksharas after Sodasa[sya] in line 11. "By …vasu a quadrangle enclosed by four buildings (chatuhsalam), a pillared gateway (toranam) and a square terrace in the middle of the courtyard (vedikah) have been built (at the shrine at) the great place of the Bhagavat Vasudeva. May Vasudeva be pleased. May (the dominion) of the lord, the mahakshatrapa Sodasa, endure." "A stone slab has been dedicated in the temple of the blessed lord of serpents Dadhikarnna." 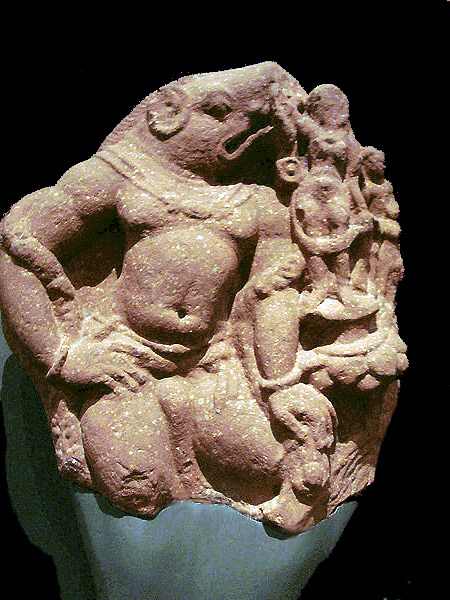 "The gift of Devila, the servant or priest at the temple of Dadhikarnna."